The Legend is back! An almost perfect jungle and bush knife, this is like the one from the movie. 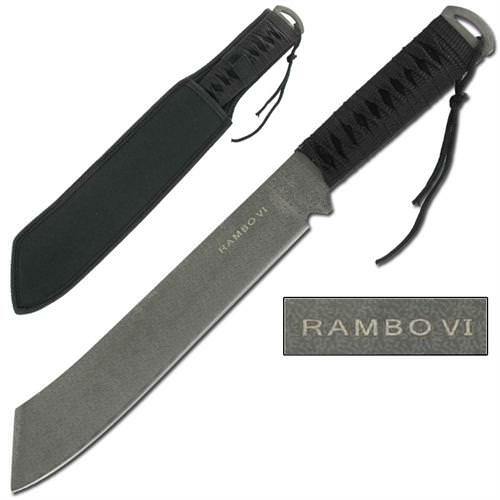 The heavy machete styled blade supports many functions and has an edge so sharp it will practically split an atom. Across the whole blade is an antique rustic finish, but underneath it is high quality stainless steel. The handle is about 19mm thick and rounded to fit the hand comfortably. Black nylon is wrapped around the handle grip to improve handling and agility. This is a full tang knife, completely functional. The pommel features a lanyard hole with Para Cord tied to the end. Thick nylon is stitched to make the stiff sheath. The sheath has a belt loop and securing strap. Get a movie reproduction that is fully functional and slices through jungle brush.